I'm excited to write this article for several reasons. Foremost is that twinleaf is flowering for the first time in my garden. 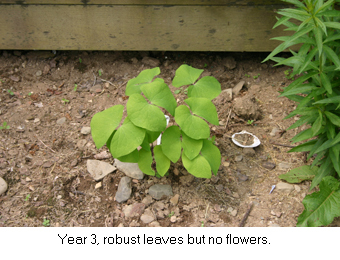 It took four years from seed to bloom, but several articles report it taking up to eight years before flowering. Twinleaf, Jeffersonia diphylla, is an uncommon spring wildflower in our area. It has a New York State rarity rank of S2, "Imperiled in New York State because of rarity (6-20 sites or few remaining individuals) or highly vulnerable to extirpation from New York State due to biological factors," but has a "demonstrably secure" global status. A quick check of specimens at Cornell's Bailey Hortorium herbarium reveals only a handful of central New York localities where it has been found. Likely it no longer occurs at some of these places. Other than J. diphylla, there is only one other member of the genus: J. dubia, which is native in Eastern China and the Korean Peninsula. Twinleaf is a perennial herb in the Berberidaceae (Barberry) family. It is one of our early spring wildflowers, blooming in our area in mid-April to early May. 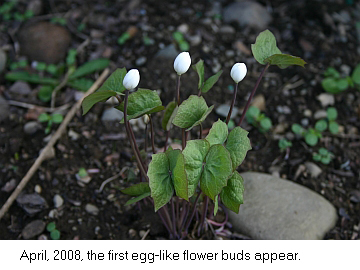 The emerging flower buds appear atop a single stem and resemble eggs. 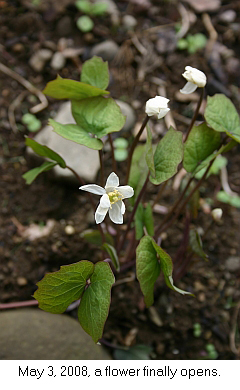 The white flower, about one-inch in diameter, has four sepals and about eight petals. A large, oddly-shaped, fruit later appears from fertilized flowers. The common name refers to its paired leaflets that resemble butterfly wings, both open and shut. The Latin name was bestowed by the famous botanist Benjamin Smith Barton to honor Thomas Jefferson, at a meeting of the American Philosophical Society on May 18, 1792 - a meeting that Jefferson did not attend. Like many of our spring ephemerals, twinleaf seeds need multiple periods of alternating cold and warm periods before they will germinate. This requirement, called stratification, is carried out by nature to ensure that our early wildflowers do not germinate prematurely during that first warm spell in April when a later May frost may kill the young seedlings. If the seeds are not fresh enough, they may not grow. 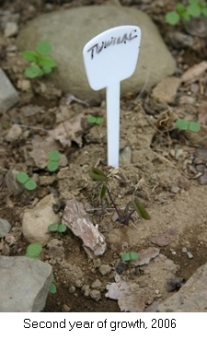 Once germinated, however, twinleaf will readily thrive and spread in rich soil with a shady habitat. They naturally like rich, deciduous woods, but mine is in a small garden bordering my back deck where it only receives the morning sun. If you'd like to see this plant in bloom, perhaps the best place to visit is the Mundy Wildflower Garden at Cornell Plantations. It flowers there beginning in mid-April. 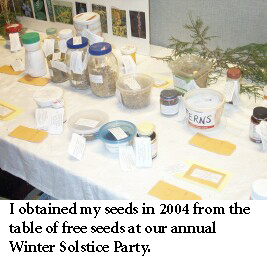 Better yet, purchase some seeds or plants and plant them in your own garden where you'll have your own welcomer of flowers to come.